JIS specifies 10 steps of strength categories for bolts. For the strength category 4.8, the first numeric character 4 indicates the nominal tensile strength 400N/mm2. The second numeric character 8 indicates the yielding point where it does not break even if 80% of 400 is applied. 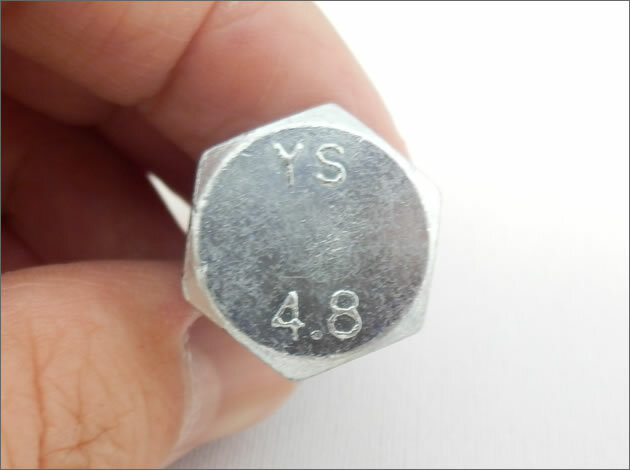 Therefore, the yielding point of this bolt is around 400 x 0.8 = 320N/mm2. The nuts also have strength categories. Nuts also have strength categories. The combinations between the nuts whose nominal height is 0.8d or above (e.g., 8mm or above when M10) and their bolts are listed below. The bolt strength varies depending on the material used and the heat treatment. The most general steel materials are carbon steel and alloy steel, and the strength category varies according to their type and heat treatment. The materials and heat treatments corresponding to strength categories are listed below. (1) Free cutting steel may be used as the materials of these strength categories. However, the maximum content of sulfur (S), phosphorus (P) and lead (Pb) shall be as per the following: S: 0.34%, P: 0.11%, Pb: 0.35%. (2) If adequate hardening is required for any screws whose nominal diameter is over 20mm, it is good to use materials for Strength category 10.9. (3) For the products of this strength category, the symbol of strength category has to be distinguished by underlining. (4) For the materials of this strength category, it is necessary to consider adequate hardenability so that approx. 90% of the center of the cross section of the threaded portion becomes martensitic structure in the state of hardening before tempering. (5) For strength category 12.9, there should be no white concentrated phosphorus layer which is visible with an optical microscope on the surface where tensile stress works. (6) At least 1 alloying element among chromium (Cr), nickel (Ni), molybdenum (Mo) or vanadium (V) should be included for alloy steel of this strength category. 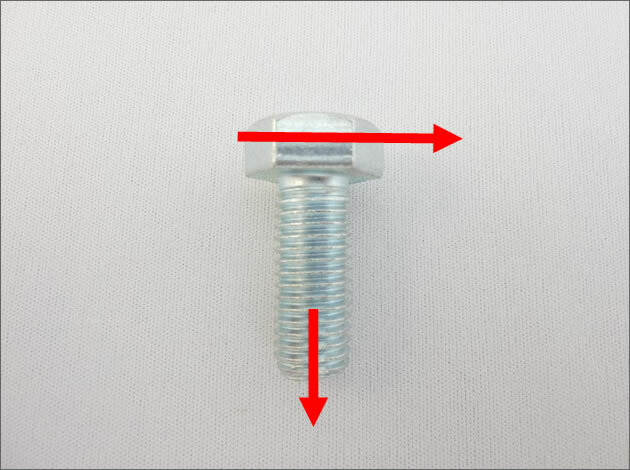 (8) When the male threaded fasteners of the strength categories 8.8 to 12.9 are tested, there should not be difference of the average hardness which exceeds 20 in Vickers hardness value. 10% of the tightening torque is transferred to the axial force. The amount of tightening torque transferred to the axial force is 10%, and 90% of it is lost by abrasion. Pay attention because it may become loose even if you think it was tightened firmly. It is possible to reduce the abrasion loss by using lubricant. Management of tightening force is important. Screws break if they are tightened with too much force, and they become loose if they are not tightened enough. Therefore, it is very important to manage the tightening force, but since there are variations caused by the conditions of abrasion and tightening works as described above, management is very difficult. As the managing method of tightening force, the calibrated wrench tightening method and the turn-of-nut tightening method are well known. he tightening torque is managed during tightening works using tools such as a torque wrench. This is a method to acquire the target axial force by turning the bolt or the nut by the set turning angle (degrees) from the state in which the bolt and the nut are completely seated.